President Obama is appointing an openly terrorist-sympathizing Muslim to head a government office dedicated to countering Islamic State propaganda. In April, Rashad Hussain will take over as director of the Center for Strategic Counterterrorism Communications, a small office within the U.S. Department of State that Obama plans to make bigger. A new component called the Information Coordination Cell will be added to the expanded center and will reportedly be staffed by intelligence analysts. It will have a staff of around 80 people and will coordinate with other government agencies. The head-chopping barbarians of the Islamic State will no doubt cower in fear because the U.S. government has, as the newspaper notes, “more than 350 State Department Twitter accounts, combining embassies, consulates, media hubs, bureaus and individuals, as well as similar accounts operated by the Pentagon, the Homeland Security Department and foreign allies”. Hussain is reportedly a devout Muslim who maintains close ties to the Muslim Brotherhood’s network in the U.S. He has been spewing radical Islamic propaganda for years. As a law student at Yale University in 2004, Hussain whined that the prosecution of University of South Florida professor Sami al-Arian was a “politically motivated persecution” calculated “to squash dissent”. How slickly these would-be squashers of dissent have learn to use the language of freedom and tolerance to advance their intolerant totalitarian ideology! The academic was recently deported and he entered guilty pleas regarding his activities as a leader of the terrorist group Palestinian Islamic Jihad. Hussain’s pro-terrorist activities have continued since he left college. In a 2008 paper for the Brookings Institution he argued that language that links Muslim terrorism to Islam itself should be avoided. “Policymakers should reject the use of language that provides a religious legitimization of terrorism such as ‘Islamic terrorism’ and ‘Islamic extremist’,” he wrote. “They should replace such terminology with more specific and descriptive terms such as ‘Al-Qaeda terrorism’.” This is, of course, exactly what the Obama administration did upon coming into power the next year. Even today Obama argues strenuously that the U.S. is in conflict only with specific terrorist groups and not with the Muslim world as a whole. In the same paper Hussain urged the U.S. to “welcome and encourage the further development of mainstream Muslim organizations and moderate institutions”. He specifically referenced the work of the Fiqh Council of North America, which is linked to the U.S. Muslim Brotherhood. Hussain has also written that, “The primary cause of broad-based anger and anti-Americanism is not a clash of civilizations but the perceived effect of U.S. foreign policy in the Muslim world.” This is, of course, the standard left-wing rationalization for Islamic aggression against the United States. It ignores the pattern of violent expansionism that has characterized Islam since the days of its founding prophet. It also ignores the fact that Islam, which is the Arabic word for submission, does not believe in the marketplace of ideas. Islam does not recognize separation of church and state. Its purpose from its creation has always been to conquer and eliminate all other religions. It must dominate. President Obama, who nowadays makes no secret of his sympathy for Islamic terrorists, picked the right man to carry out his policies. Hussain has already been working for the Obama administration for five years. In February 2010 Obama appointed Hussain as his ambassador to the Organization of Islamic Cooperation (previously known as the Organization of the Islamic Conference). [The expert on Islam] [Robert] Spencer describes the OIC as “the thuggish international organization that is engaged in a full-scale campaign to intimidate Western governments into adopting hate speech codes that will effectively quash criticism of Islam — including jihad violence perpetrated in its name.” OIC has long been pushing the myth that there is such a thing as “Islamophobia”. Of course, Hussain was a natural fit for the OIC, which itself is tied to the Muslim Brotherhood. It consists of 56 member states plus the Palestinian Authority and aspires to impose shariah law on the entire world. It seeks to reestablish the Islamic Caliphate. Now that Obama is safely reelected and the final off-year congressional election of his presidency is completed, he doesn’t care about appearances anymore. Obama doesn’t feel the need for the careful, studied, Alinskyite deception that marked his first six years in the highest office in the land. Now he is free at long last to be Obama and to let his Chicagoland, red-diaper baby, freak flag fly. His despotic power is essentially unchallenged. 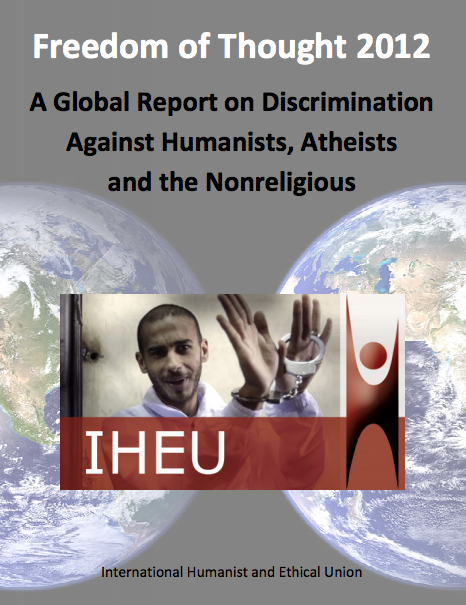 On December 10, “Human Rights Day”, the International Humanist and Ethical Union published Freedom of Thought 2012: A Global Report on Discrimination Against Humanists, Atheists and the Nonreligious, edited by Matt Cherry. In Afghanistan, Iran, Maldives, Mauritania, Pakistan, Saudi Arabia, Sudan atheism is a capital crime. Most executions for the crime of atheism are carried out in Pakistan. “In a range of other countries — such as Bangladesh, Egypt, Indonesia, Kuwait and Jordan — publication of atheist or humanist views on religion are totally banned or strictly limited under laws prohibiting ‘blasphemy’. Max Fisher at the Washington Post provides this map of the countries where atheists are executed, imprisoned or discriminated against by law. Restrictions against “religious incitement” … are common in much of the world, including in atheist-friendly Western Europe. Such laws are applied in many European countries to the critical examination of Islam. And if the Organization of Islamic Co-operation (OIC) – which includes a delegate or “special envoy” from the US, Obama appointee Rashad Hussain – has its way, criticism of Islam will be a punishable offense all over this Islam-diseased world. The Obama administration supported a UN resolution against “defamation of religion” in December 2011. Obama wants the Muslim Brotherhood to participate in the government of Egypt, the country where it was founded but in which it is officially banned. Obama may or may not be a Muslim, but it’s plain enough that he holds Islam in high esteem. He has steadily extended its reach and influence inside the United States, strengthened Islamic regimes, and facilitated the spread of sharia. We see him as a man with a mission – to aid the advance of Islamic power. Here, in selected quotations from two articles at FrontPage Magazine, are facts and informed opinion that support our contention. President Obama chose Rashad Hussain to be his special envoy to the Organization of the Islamic Conference. He has long been a featured speaker at conferences by Brotherhood-tied groups in the U.S., … has spoken for ISNA since being appointed, and has shared the stage with officials from the Council on American-Islamic Relations (CAIR), another Brotherhood-tied group that has been listed as an “unindicted co-conspirator” in the Holy Land Foundation trial. The influence of Brotherhood groups in the government even extends to the FBI and military. An official from ISNA was asked to lecture U.S. troops at Fort Hood about Islam after the terrorist shooting took place. The FBI has also held meetings with top ISNA officials and is engaging the organization as part of its outreach to the Muslim community. Shockingly, the decision to use the ISNA came after the FBI decided to end its relationship with CAIR because of concerns over the organization’s ties to Hamas and designation as an “unindicted co-conspirator”—the same label applied to ISNA from the same trial. Obama has empowered the Islamists not only in the Muslim world, but also inside in the U.S. Could anyone have imagined the U.S. president [would] support the building of a mosque on Ground Zero against the wishes of his own people and the families of the victims? Could anyone have imagined that Islamists are being hired in our homeland security apparatus and in the White House? Could anyone have imagined an American president bowing before the Arabian despot King whose countrymen were behind 9/11? … Who could have imagined that the first US president elected after 9/11 would declare … that America is … a Muslim nation? How can these actions and policies of Obama’s be explained if not by his being devoted to Islam? Islam is waging war on America, and America’s head of state is devoted to Islam?